Today: Homemade almond milk, with sugar and spice. WHO: Onetribegourmet is a realtor and food blogger in Philadelphia who loves to travel. WHAT: Homemade almond milk, without an overnight soak. HOW: Throw some almonds in a food processor, process into a paste, then simmer in water. Strain, then spike with orange blossom water and cinnamon. 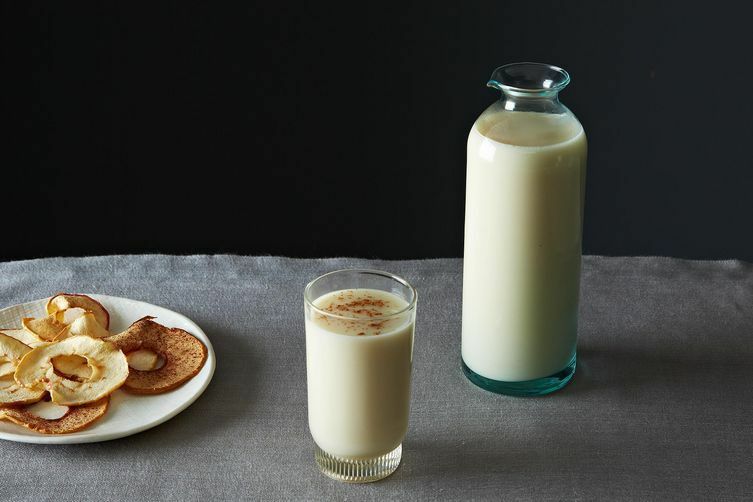 WHY WE LOVE IT: Making almond milk from scratch is a perfect example of kitchen magic; each time we do it, we can't believe how easy -- and how good -- it is. We love the way onetribegourmet flavors hers -- we'll take a glass with breakfast, and with our afternoon snack. How long does fresh almond milk keep in the refrigerator? What can be substituted for orange blossom water, it's not available here in South Africa? I too love the glass carafe. I make almond milk every week and would love to have a simple carafe with a spout to pour into my cup of tea. I love the glass carafe. Where did you get it?